Inciting Event: Dastan captures the dagger. 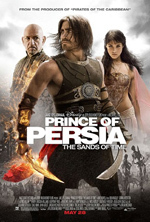 First Plot Point: The king is murdered and Dastan escapes after being accused. First Pinch Point: Sheik Amar recognizes Dastan and tries to steal the dagger. Midpoint: At the king’s funeral, Dastan realizes his uncle Nizam killed the king, and Nizam tries to kill him to gain the dagger. Second Pinch Point: The Hassasins attack the secret temple and kill Dastan’s brother. Third Plot Point: Dastan kills himself to show his other brother, the new king, how the dagger works. Climax: Nizam unleashes the sands of time. Climactic Moment: Nizam is killed. Resolution: Dastan proposes to Tameena.